Talk about killing two birds with one stone. I had a few errands to run tonight. We needed bread, so I needed to go to the Aunt Millie’s Bakery Thrift Store. I needed Coke Zero, so I had to go somewhere. J said she wanted ice cream with dinner. I could accomplish all three tasks on one street. 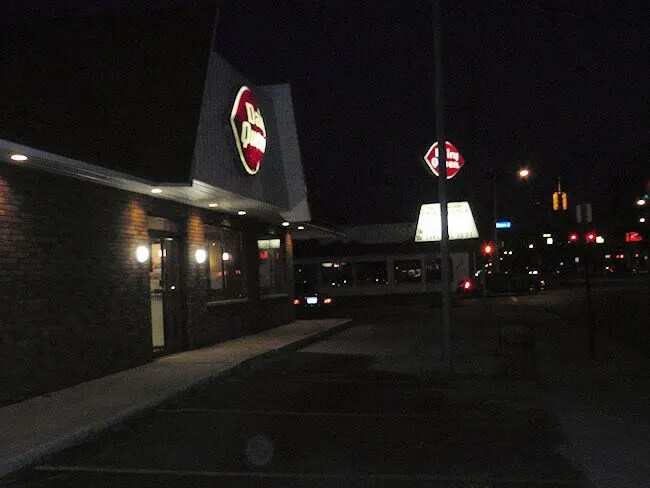 After getting bread then heading to Harding’s for Coke, we headed to the Dairy Queen on the corner of Lovers Lane and Cork Street in Kalamazoo’s Milwood neighborhood. The store is right on the corner and there are entrances from both streets. The entrance from Cork Street probably isn’t the preferred entrance anymore, but you can enter there then drive around to the back where there’s a much bigger parking lot. Actually, that’s exactly what we did. First, a little back story. Growing up in a town of just 750 people, we had very few options when it came to dining out. There were two family restaurants in town and then the Dairy Queen out by the Interstate. It was only half a mile or so outside of town, so we could ride our bikes and most of my friends had their first jobs making both hot eats and cool treats. Hell, my mom even worked there for a while after my brother and I started school. If it wasn’t for our paper routes, my brother and I would have probably worked there too. It’s just what you did growing up in a small rural community. It goes without saying, DQ has a special place in my childhood. That is, until they closed that building and moved five miles north to the new gas station where it remains to this day. I really haven’t eaten at a Dairy Queen outside of my hometown in the ten years since I moved away. Only once or twice have I seeked out the DQ. Today was one of those rare visits just because I knew the DQ we were heading towards had both hot food in addition to the ice cream. There weren’t many people in the store when we walked in. The building is only sparcely populated with the traditional DQ booth. The interesting thing about the building is the ceiling. It’s an authentic tin roof which was salvaged from a building downtown and transplanted to the Dairy Queen in the 1970’s. There’s a plaque on the back wall explaining where it came from. The menu isn’t as big as I thought it would be. It didn’t seem to be the whole Dairy Queen “Hot Eats” menu. The menu board above the order counter was dominated by ice cream. A couple panels had the food menu including one that was labled “Local Menu” which had items somewhat unique to Michigan including an Olive Dog. I ordered a bacon cheeseburger and a medium Oreo Blizzard. The Blizzard order happened almost instinctively. It’s what I always used to get. In recent years, I’ve been getting Reese’s Peanut Butter cups when I get Blizzard-like creations from other places. I didn’t even think of that until I started writing this. J went with just a small fry and a Fudge Brownie Temptation. Out total for “dinner” was a little over $13. The ice cream was made right away and we took a seat and started eating that while our food was being cooked. It doesn’t take long to grill a burger and drop some fries in the fryer. Less than ten minutes later we were handed a bag and headed home. My burger was pretty much what I remembered. Nothing special. Frozen patty on a soft bun with melted cheese and a couple small pieces of bacon. 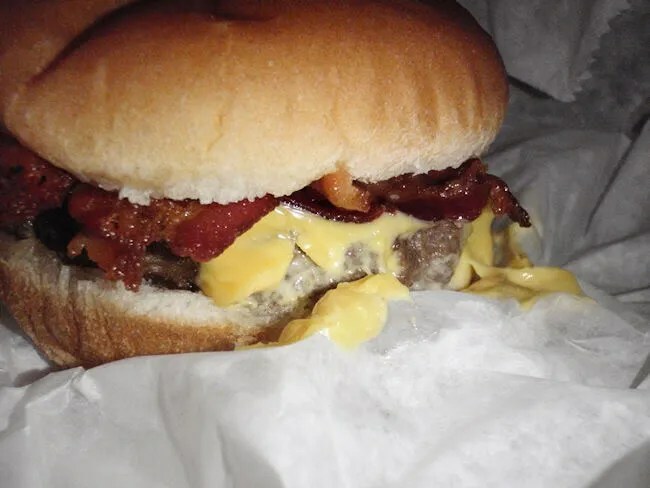 It’s nothing special, but good for what it is….a nice and greasy cheeseburger. J’s Fudge Brownie Temptation looked really good and if you’re going to eat ice cream for dinner, why not make it this. The bowl it came in was a chocolate enrobed chocolate waffle bowl. 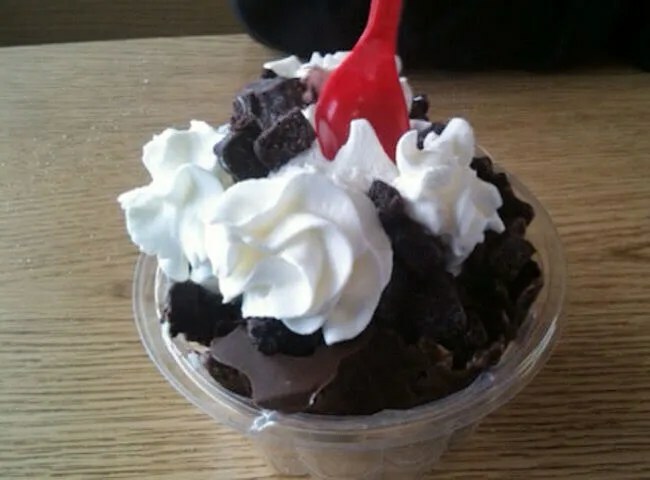 It’s then filled with soft serve ice cream, fudge, brownie pieces and whipped cream. It took her a lot longer to eat her ice cream than it did for me to eat my Blizzard and my burger. I stole a few bites from her and it was pretty tasty with the little brownie bits. The fries are regular fast food fries. By the time we started to eat them, they were a little cold. It’s hard to tell if they had been sitting or if we just waited to long to eat them. It’s quite possible it was our fault because we didn’t eat them until so long after we left the store. Dairy Queen served it’s purpose tonight. That’s about all I can say. The food has never been five-star quality, but it’s always treated me right. What a trip down memory lane. 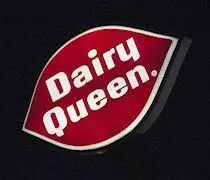 I used to live in Kalmazoo, and we would go to DQ on Lovers Lane in Milwood a couple times a month for a treat.